CarGurus has 9,349 nationwide Flex listings starting at $4,700. After a significant makeover in 2013, Ford decided to keep the Flex essentially unchanged for 2014, and it's hard to blame the blue oval for that decision. Last year's changes were well received, from the softer exterior lines to the increased power in the drivetrain, and the Flex maintained the roominess, smooth handling, quality materials and comprehensive comfort and technology features that made it a well-received midsize SUV in the first place. If you want to make sure your 2014 Flex stands out from the 2013 version, there is a new available appearance package for the two higher-end trims, the SEL and Limited, but not for the base SE. This package includes machined aluminum 20-inch wheels with premium painted pockets, black painted exterior mirror caps, your choice of black or body-color roof, leather-trimmed seats with gray perforated leather inserts, leather-wrapped steering wheel with Meteorite Black inserts, unique instrument panel and door trim appliques, and floor mats with a unique logo. 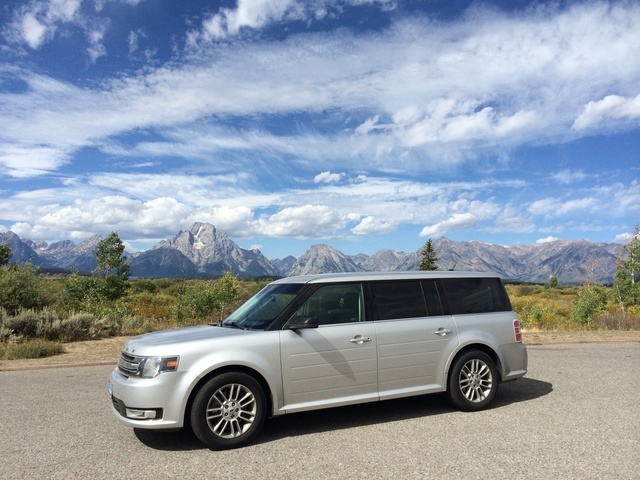 After adding 23 hp and 7 lb-ft/torque for 2013, things have stayed the same for the Flex's standard powertrain in 2014—a 3.5-liter V6 Ti-VCT engine paired with a 6-speed SelectShift automatic transmission that gets 287 hp at 6,500 rpm and produces 254 lb-ft of torque at 4,000 rpm. With the standard front-wheel drive, that powertrain gets 18 mpg city/25 highway. The upgraded powertrain also stays the same for 2014—a turbocharged 3.5-liter EcoBoost V6 mated with a 6-speed automatic transmission with paddle shifters that produces 365 hp at 5,500 rpm and 350 lb-ft of torque at 3,500 rpm. All that extra power doesn't detract too much from fuel efficiency (17/23). That upgraded engine (available in the Limited trim only) is always delivered with all-wheel drive. For such a large vehicle, the Flex has received plenty of compliments for its smooth ride, so Ford left well enough alone with the suspension systems and shocks. The front supsension is comprised of gas-pressurized independent MacPherson struts with rear-facing lower L-arms. In the rear, it's a fully independent multi-link suspension fully isolated on the rear subframe. The shocks in the front and rear are both gas-pressurized twin tubes. The SE is the base trim, but it has more than just base standard features, including SYNC with MyFord (voice-activated technology that allows for hands-free calling and texting, music control and 911 assist), a rear auxiliary system for the climate controls, a leather-wrapped steering wheel and shifter knob, a reverse sensing system, MyKey that allows the owner (read: parents) to control speed and music-volume limits, adaptive cruise control, steering-wheel audio controls for the 6-speaker system, four 12-volt power points, 17-inch painted aluminum wheels and dual chrome exhaust tips. Move up to the SEL trim, and the SYNC system upgrades to MyFord Touch. That may not be a good thing, since that system with its 8-inch touchscreen and dual 4.2-inch cluster screens was at the center of the negative press the Flex received, because it was just too confusing and difficult to navigate. Other standard features include a 10-way power heated driver's seat, a 6-way power heated passenger seat, dual-zone automatic climate control, power heated mirrors, a universal garage door opener, SiriusXM satellite radio and interior woodgrain appliques. Optional features for the SEL include adjustable and memory-capable pedals, mirrors and driver's seat, a rear-view camera, remote start, cross-traffic alert system, navigation system, second-row refrigerated console, dual headrest DVD entertainment system and a multipanel vista roof. If you take the leap to the Limited trim, the navigation system, cross-traffic alert system, remote start and rear-view camera all come standard, as does a 12-speaker Sony audio system with HD Radio technology and push-button ignition. The extra Limited trim options include cooled front seats, a power-folding third row and active park assist. Standard safety and security features for the all 2014 Flex models include canopy system side curtain airbags, frontal and seat-mounted side airbags for the driver and passenger, anti-lock brakes, automatic exterior light control, headlight washers, low tire pressure warning system, illuminated entry, remote keyless entry, panic alarm, SecuriLock ignition disable and a theft deterrent alarm system. 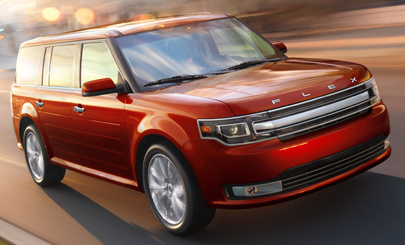 What's your take on the 2014 Ford Flex? 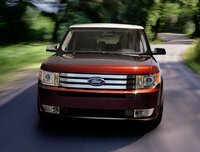 Users ranked 2014 Ford Flex against other cars which they drove/owned. Each ranking was based on 9 categories. Here is the summary of top rankings. Have you driven a 2014 Ford Flex? Is Ford Flex Vin:!c183064A Still Available?